While addressing a meeting of ambassadors and permanent representatives at the Russian Ministry of Foreign Affairs, Vladimir Putin called for a complex set of measures to protect Europe from a repeat of the Iraqi, Libyan, Syrian, and Ukrainian scenarios. Russian President Vladimir Putin laid out his vision for a new European approach to conflict resolution at a meeting of ambassadors and permanent representatives of the Russian Federation, held at the Ministry of Foreign Affairs in Moscow from 30 June to 3 July. The address by the president, which in accordance with the Constitution defines the country’s foreign policy, became the defining event of the forum, whose motto is “The protection of national interests and reinforcing the principles of international co-operation”. Putin announced that he has entrusted Russia’s Ministry of Foreign Affairs with preparing a complex set of measures to protect Europe from a repeat of the Iraqi, Libyan, Syrian, and Ukrainian scenarios, with a particular emphasis on preventing attempts to influence internal political processes externally. “We need a pan-European insurance framework, so that the Iranian, Libyan, Syrian, and Ukrainian precedents do not turn out to be contagious,” Putin declared, arguing that the challenge is to write the principle of non-intervention into European reality. He said that Russia is ready for constructive dialogue with the United States of America but this is only possible on a level playing field, whereas what Russian authorities were currently hearing were “outright categorical, instructional overtones,” besides threats to introduce ever more severe sanctions. This year’s gathering was the seventh such meeting of ambassadors, who convene in Moscow once every two years, though for a 16-year period from 1986 to 2002 the tradition was discontinued. Putin dedicated a significant portion of his speech at the forum to global politics, which is becoming less and less predictable as old conflicts flare up again and new conflicts arise. On the subject of Ukraine, he pointed out that the emergence of such a hotbed of tension right on Russia’s borders could not have been ignored, especially in view of the fact that the fate of Russians themselves, their language, history, and culture were seen to have come under threat. “What sort of a reaction did our partners expect from us as the situation in Ukraine developed?” Putin asked. He himself responded to this question: “Russia did not have the right to leave residents of the Crimea and Sevastopol at the mercy of militant nationalists and radicals. 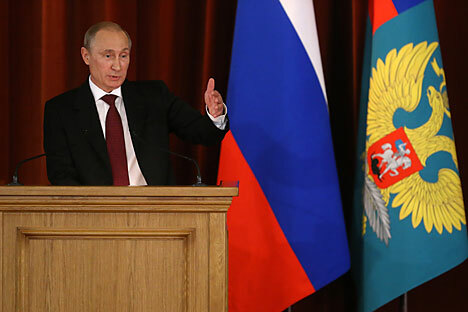 From his podium the president warned that Russia would henceforth actively defend the rights of Russians, as well as her compatriots abroad, using all available means - from political and economic to humanitarian operations permitted under international law, as well as the right to self-defense. In the opinion of Putin, the situation in Ukraine is the culmination of a “notorious policy of restraint” that has been exercised by Western nations and is the culmination of negative global trends. This being the case, any diplomatic attempts by Russia to settle this matter peacefully would have been rejected. On the eve of his speech, Putin had suggested abandoning the use of military force and continuing talks with the insurgents in south-eastern Ukraine in a telephone conversation with Ukrainian President Petro Poroshenko and the leaders of Germany and France. However, these attempts turned out to be in vain, as Poroshenko subsequently gave an order to recommence full-scale military action, the implications of which Putin noted. “Up until now Petro Poroshenko has in any case not been directly involved with orders to commence military action. He has now wholly assumed this responsibility, this is not only a military but also a political one, which is much more important,” Putin said. In Putin’s opinion, the conflicts in the Middle East, Africa, and Europe are testimony to growing protests against the imposition of a unipolar model of the world, in which one country tries to dictate its will. He emphasized that, although relations with the West remain very tense, Moscow continues to develop trade links with the European Union, first and foremost in the field of energy engineering - both in the development of gas infrastructure and the South Stream project to deliver natural gas from Russia to Central Europe via the bed of the Black Sea. The president went on to indicate that Russia is looking to pay particular attention to co-operation with Asia and Latin America, singling out China. He stressed that it was very important to understand that the Sino-Russian friendship was not directed against anyone. “On the contrary, it represents an example of equitable, respectful, and productive cooperation between nations in the 21st century,” he said. As Mikhail Margelov, Chairman of the Foreign Affairs Committee of the Federation Council, who attended the meeting at the Ministry of Foreign Affairs, said to RIR, recent events have accelerated Russia’s goal to expand her potential for overseas trade with the East. “They have ‘accelerated’ this aim because Putin’s visit to China was planned well ahead of the crisis in Ukraine. Russia has been developing plans and case studies of one sort or another for economic ties between Russia and the Asia-Pacific Region for at least the last ten years,” said Margelov. “Russia has entered into the complex network of countries in the Far East and South-East Asia and is at last using her unique geopolitical location between these global economic centers. This is not a departure from Europe but rather a geo-economic decision,” he added. Concluding his speech, Putin thanked Russian diplomats for their professionalism in very difficult circumstances during the Ukrainian crisis. Nonetheless, the situation is far from being resolved, and there is still much work to be done.